Tickets include- Entry to watch each of the lectures, coffee, food, drinks, and a raffle ticket. 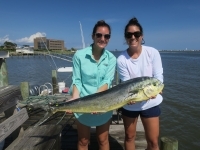 The purpose of the event is fund-raise by having local captains come in and teach attendees about different topics including: King Mackerel, Blue water, Bottom, Inshore, and boating tips. Our club is all about teaching students and people in our area everything from rig-tying and cast-net throwing to species identification and regulations. We love teaching people who haven't had the opportunity, whether they come from another state, or just didn't have the resources, about saltwater fishing. We raise money for our club by selling entry tickets which provides the attendees entry to watch each of the lectures, food, and a raffle ticket. A large portion of the money we receive comes from additional raffle tickets that we sell to give out various products from fishing/local companies and sponsors that support what we do as a club. Products we raffle vary by year but are always worth checking out! Last year we raffled off over $2500 worth of fishing items such as reels, tackle, YETI Coolers, apparel, giftcards, etc. Tickets will only be available at the door the morning of as well as complimentary coffee. We do not pre-sale tickets. For more information send an email to jtcoleman@coastal.edu and I will get back to you as soon as I can. This event page will be constantly updated to give you the most updated schedules as well as new announcements for product to be raffled away. Be sure to give our page a like and check out our Youtube channel! Thank you all for your continued support.